spe1962 - Mesa, AZ Excellent Tire Warmers "It's nice to see the current temp and you can see when the warmers are on and off. Wish I'd spent the money on these before." MotoNewbie - Greater Detroit area Great price, no complaints "Consistently cost less than most others I have researched, and having owned a half dozen sets, I've never had a complaint about the quality. I drag my knee through the overwhelming majority of freeway on-ramps, so I go through a lot of them. 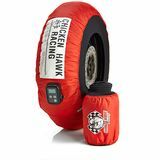 Every time I have looked at knee sliders (typically two sets per season), I always end up buying Chicken Hawk Racing sliders. They are larger than many others costing more, stay in place well, and last about as long as I would expect (I am unusually harsh on sliders). The only reason I can think of to not buy Chicken Hawk Racing knee sliders would be to keep a uniform set complete. My leathers are off brand, so it doesn't matter. 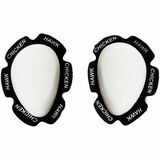 These are the only sliders I buy."